In many ways, this is the hardest time of the year for me. Signs of spring are starting to show up all over. A walk around the garden late this afternoon showed many plants starting to pop up after a short winter’s rest. Several daylilies are already six inches high. The true lilies that I have planted in the last few years are also up. With all these signs of spring, I need to be outside working in the garden. I need to get my hands dirty. I need to plant something, anything. So, why haven’t I been able to get outside? First, work is taking up more of my time, then, there is the weather. While we have had warm, pleasant temperatures, there has also been several days of very light rain. Even though the rain has not been heavy, it does make everything so damp, and the soil unworkable. All this adds up to frustration for me. However, all that being said, I am grateful for the weather we have. At least I can get out and walk around and check out what’s growing and/or showing up lately. I know so much of the country is still immersed in deep winter and can’t do anything but dream of warmer temperatures and newly emerging plants. Here’s hoping this weekend will be good gardening weather. Friday night, I was talking to my sister who lives in northern Virginia, and she was remarking about the flowers blooming in my garden right now. She was saying, that except for a few hollies, it is mostly brown in her area. Evidently, there are few pines or conifers around where she lives. This made me realize how lucky I am to be living in the Coastal South where there is always something blooming, and with so many evergreens and conifers around, it is always green. Even though we have had some cold weather lately with temperatures dipping into the upper twenties, I have noticed that there is already new growth showing on many plants, the roses for example. 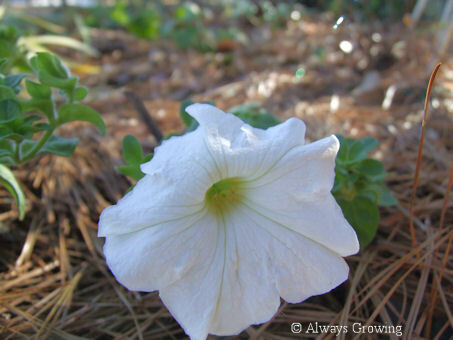 Many plants are already pushing up through the ground and do not seem to be bothered at all by the recent cold temps. Lilies, daylilies, and irises are already showing top growth. 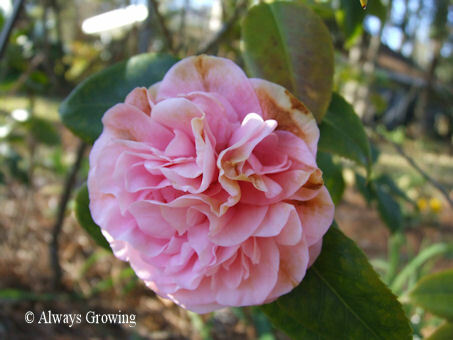 This time of year, the camellias are the real show stoppers. My big camellia has started blooming. It is a little later than usual, but I am sure it is because of the colder than normal weather we had in December. 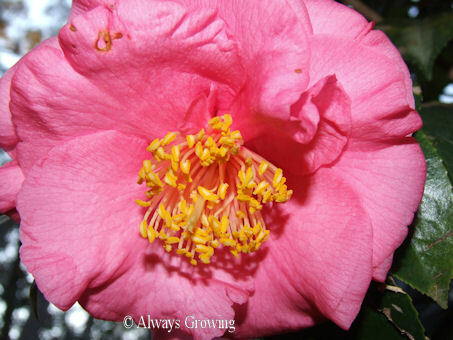 This camellia was already a large one when we moved in to our house years ago. I figure it has to be 45 to 50 years old. It is at least eighteen feet tall and is covered in buds. In a short time, it should be covered in flowers. So, this is for all of you gardeners who will have to wait a while longer to see flowers finally showing up in your area. Finally, able to work outside. The past few days have been mild enough to work outside in the garden. I can’t remember the last time I was able to do that. Monday, was a particularly nice day – mild and sunny. How nice since I had the day off from work. Here, in the Gulf South, we have to get most of the heavy garden work done before the heat shows up. I try to get as many of these chores done in late winter, but, as often happens, work, weather, or family obligations will interfere with my good intentions. 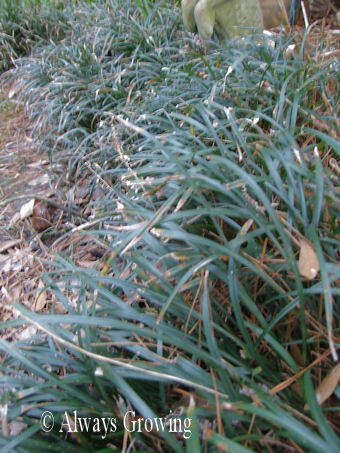 One of the jobs that often gets pushed to a back burner is the trimming of the liriope. 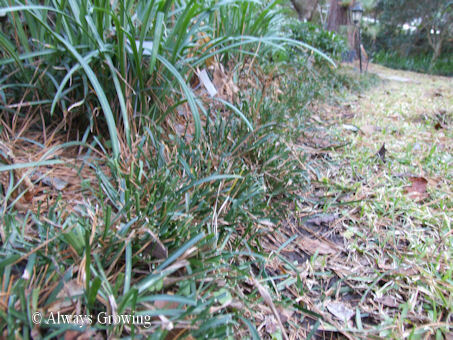 I have edged most of my garden beds with liriope and late winter, before the new sprouts show up is the time to trim it back. Trimming it gets rid of the old, cold-damaged foliage. This year, I have started early. Here are the before and after photos. After trimming the liriope, the question becomes what to do with it. Well, I just can’t bring myself to just throw it away, but luckily this trimming coincides with the falling of the live oak leaves. This makes the perfect time to clear out the compost bins and load them up with the liriope and oak leaves. 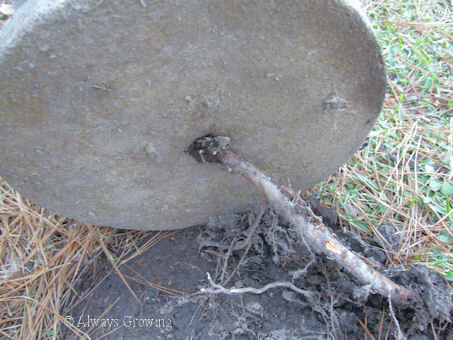 It is always recommended to have layers of green and brown yard waste to make for quick cooking compost. Before I could start layering new material to make compost, I had to clear out the old bins. I was so pleasantly surprised because, as I shoveled the “gardener’s gold”, I realized that this was the best compost I have ever made. Wonderful, crumbly leaf mold. One bin yielded two large garbage cans worth of black humus. I plan on spreading this in the garden this weekend. After clearing out the bins, the next step was to start layering the oak leaves and liriope. I put down a layer of about four inches of oak leaves, moistened it and then added about four inches of the liriope and then moistened that layer. Layer after layer, and the first bin was quickly filled. The second bin will be finished by the weekend. 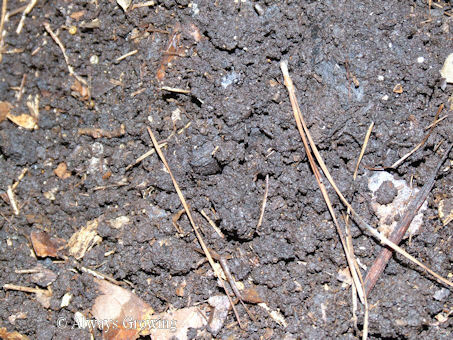 On Tuesday night, it rained about a half an inch, just enough to keep the new compost happy. 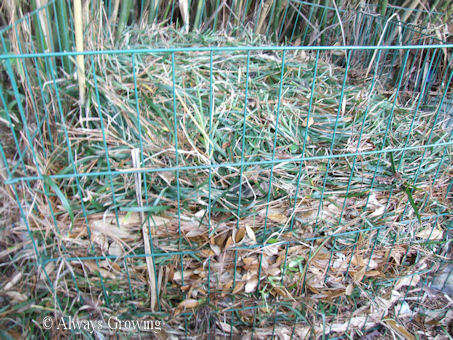 I think this compost may be ready earlier than the ones I started in the past since I have more green layers than usual. If I get compost from this new batch that is as good as my last batch, my garden will be very happy. I was happy just to be outside in the sun and warm temperatures working in my garden. Serndipity – good luck in making unexpected and fortunate discoveries. 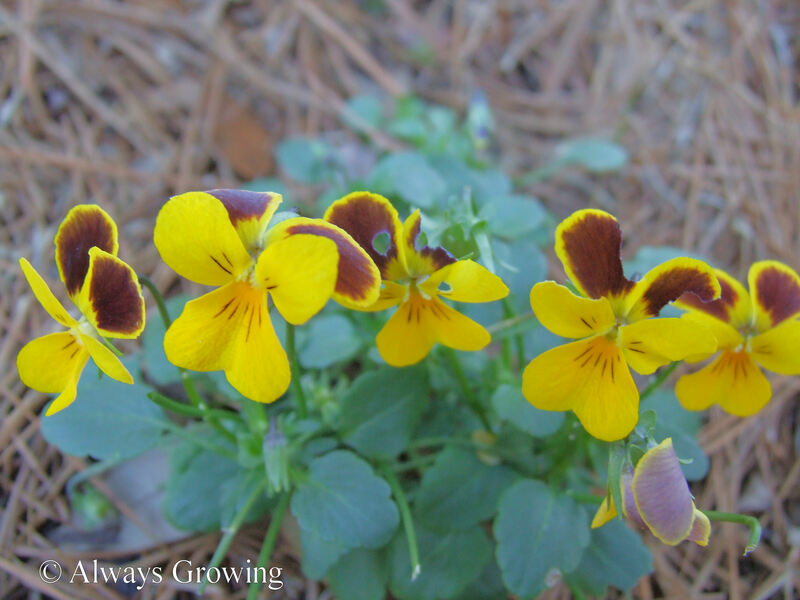 When I purchased my yellow violas, I certainly had good luck in an unexpected discovery. 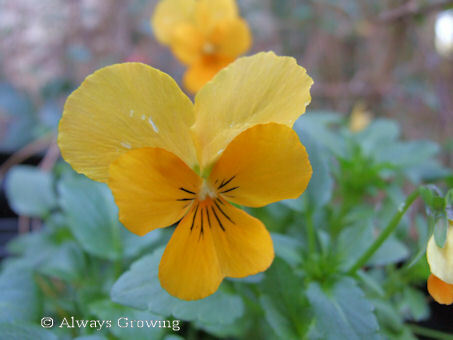 One of the violas turned out to be different from all the other solid yellow ones. 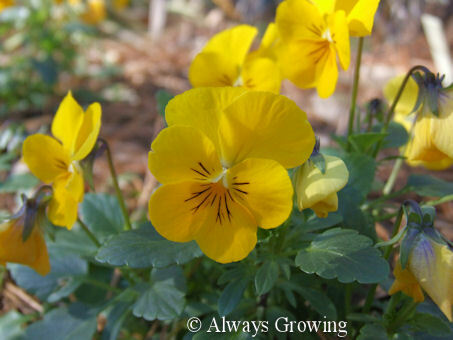 I discovered this weekend that one plant turned out to be yellow with brown top petals. I think the brown top petals look like little ears – a la Mickey Mouse. 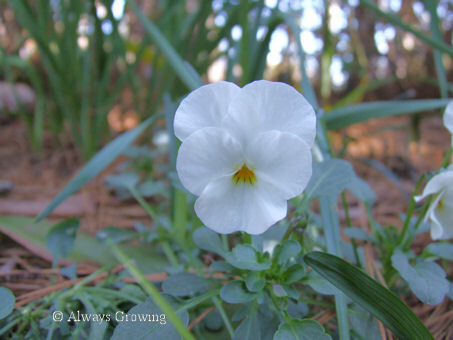 Usually, when a “wrong” color on a plant shows up, I am a little upset if I am planning a sweep of one color, but this little viola doesn’t upset me since it so cute. It is recommended that you buy plants that are not in bloom as these are usually stronger plants, but if you want particular colors, you must buy plants with some flower color showing. I have been disappointed too many times with clashing colors, so now I only buy plants with flowers. In buying flats of plants though, not every plant will be in bloom. 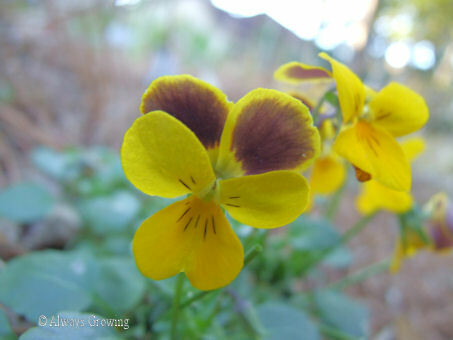 But, in this flat of yellow violas, I am glad this little viola showed up. The second week of January is traditionally when our coldest weather appears here in South Louisiana, but this year, December brought extreme cold for us. This week rain and mild temperatures are predicted, and it looks like the same for next week. While our last freeze date is March 1st, it is rare to get hard freezes after January. The last week has been rather mild, and signs of life are already appearing. New sprouts are starting to show, and even the yellow hibiscus, after being protected from the cold, had a flower. Speaking of flowers, a new one has shown up in the garden to cheer up the gray, rainy days. 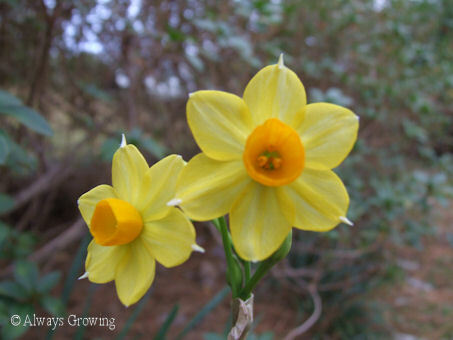 While the paperwhite narcissus have been blooming for over a month, this is the first of the yellow narcissus to show up. Last January, these didn’t start blooming until the very end of January. I am hoping this is a sign that the extreme cold weather of this winter is over. I have just finished three years of blogging, and January 1st started my fourth year. It really doesn’t seem that I have been posting that long until I look back at the posts and see how much my garden has grown and changed. Since there is not a great deal to do in the garden in January, I usually start planning about now what changes or additions that would be nice to do when the weather warms up. 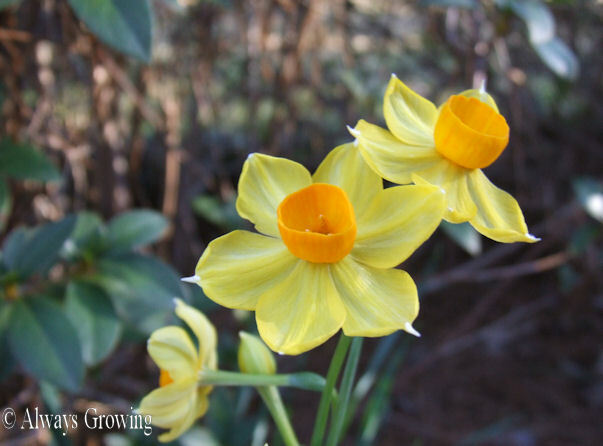 One of my goals this gardening season is to try some new plants – three new plants. 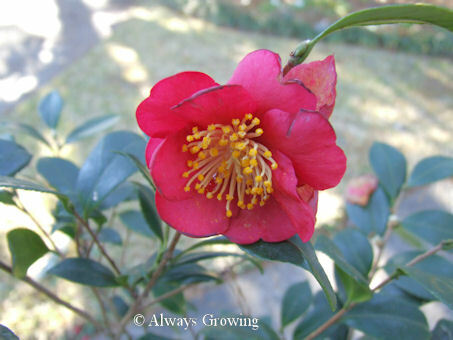 New plants that may fill a need or just be something new to see how they grow in my garden. 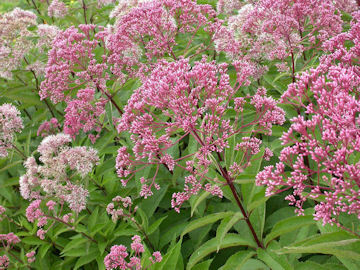 One of the plants I am going to try is Joe Pye Weed. Scott over at Rhone Street Gardens had a great post about this plant. 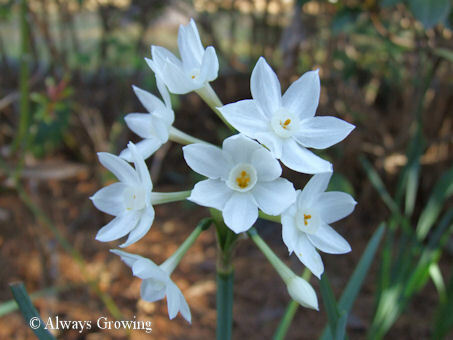 After seeing this on many garden blogs, I have been saying I want to try this plant for a few years now, and 2011 is going to be the year. I have just the spot for some of these plants, and the color of the blooms should be perfect with the surrounding plants. I know that “they” tell gardeners not to buy plants without having a definite plan and place for them, but who listens. I don’t have a place in mind yet, but this will be the year I get the grass “Cosmopolitan”. 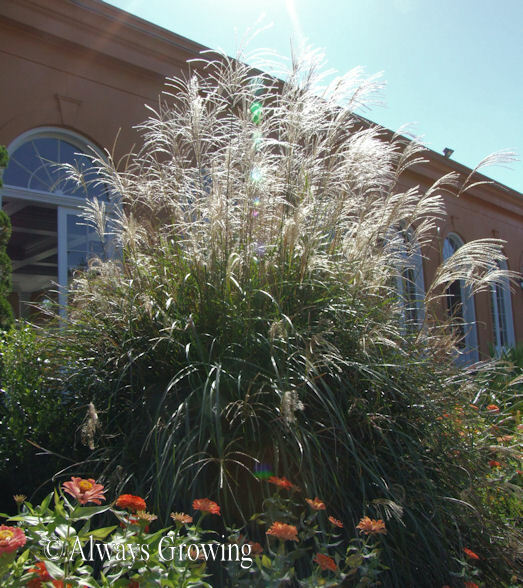 Every year when we visit the New Orleans Botanical Gardens in the fall, this miscanthus sinensis grass is gorgeous. The tassels are spectacular. This is a large grass, but there are a few spots in the garden where it would fit. I am just going to get it and then figure out where to put it. Of course, I may be inspired by an appropriate area before I actually buy it, but, knowing how I am, I doubt it. My third new plant will have to be planted in the fall of ’11. I have been wanting to have bluebells in my garden ever since I saw them at Long Vue Gardens. It is the Spanish bluebells (Hyacinthoides hispanica), rather than the English bluebells, that flourish here in our mild climate. I almost bought some bulbs this past year, but procrastinated (again) and now the spring garden will have no bluebells. I am determined to change that this year especially after seeing the photo of bluebells (English) on Charlotte’s (The Galloping Gardener) blog. What I wouldn’t give for a sight like that. Even though this is the beginning of the year when most people do the resolution thing, I consider acquiring these three plants to be a goal for this gardening year, not a resolution. This goal, for plants that I have been wanting to have in the garden for a long time, should be easy to accomplish with only three plants to buy. Today is Garden Blogger’s Muse Day, day to post a poem relating to gardening , nature or whatever strikes you. Thanks to Sweet Home and Garden Chicago for starting Garden Bloggers’ Muse Day. 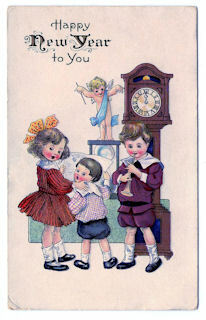 Best wishes to everyone for a healthy and prosperous new year.